Late in 2014, a federal court in Utah challenged the constitutional underpinning of most federal environmental laws. Likely appeals in 2015 could set up the U.S. Supreme Court to decide not only the constitutionality of the Endangered Species Act, but the reach of the federal government to regulate water, air, and a clean environment. On Nov. 5, 2014, a federal district court judge in Utah struck down regulations adopted under the federal Endangered Species Act protecting the Utah prairie dog on private land as an unconstitutional exercise of federal authority under the Commerce Clause (People for the Ethical Treatment of Property Owners [PETPO] v. U.S. Fish and Wildlife Service). The court found that the prairie dog was a purely "intrastate" species that had no known commercial value and therefore no connection to interstate commerce. This decision, unless reversed on appeal, could potentially undermine the government's ability to effectively enforce the Endangered Species Act. It also has implications for how far other laws like the Clean Water Act can go to protect wetlands and water quality. The Utah decision was a surprise because five U.S. courts of appeal previously upheld protections for local species such as the Delhi Sands fly and the red wolf, and the U.S. Supreme Court has twice refused to review the issue. The government will likely appeal PETPO to the Tenth Circuit. A decision upholding the ruling would create a conflict among the circuits and increase the likelihood of Supreme Court review. Congress adopted the Endangered Species Act of 1973 (ESA) to protect endangered and threatened species from harmful development and other activity. The legislation prohibits anyone from "taking" or harming any species determined to be "endangered" or "threatened" and from modifying the habitats of those species in a way that significantly impairs the species' basic behavior patterns. The law authorizes the Fish and Wildlife Service (FWS) in the Department of Interior to determine which species to place on the endangered species list, to identify and define habitat areas, and more generally to administer and enforce the legislation and regulations adopted under it. In cases, like this one, where the constitutional challenge is based on the argument that the federal government lacks the power under the Commerce Clause to regulate a particular activity, the government is required to show that the activity being regulated has a "substantial economic effect on interstate commerce." However, the court has allowed the government to demonstrate a "substantial effect" by considering the cumulative impact of the activities of others similarly situated. The district court in Utah did not question Congress's power to adopt the ESA as a comprehensive regulatory program under the Commerce Clause. In applying the "substantial effects" test, however, the court insisted that the appropriate referent was not the federal law protecting endangered species generally but the specific regulation protecting the Utah prairie dog. 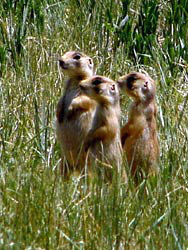 Because the Utah prairie dog's habitat is entirely intrastate, and because the prairie dog itself has no immediate commercial value, the court determined that failure to protect this particular species would not have a substantial impact on interstate commerce and therefore could not be justified as an appropriate use of the commerce power. This decision is at odds with the decisions of the five federal Circuit Courts that have previously considered and rejected challenges to other applications of the ESA. The Fifth Circuit, for example, upheld against a Commerce Clause challenge an ESA regulation protecting six species of tiny subterranean cave-dwelling invertebrates found only in two counties in Texas even though there was no demonstration that these tiny creatures themselves had any immediate commercial value. Similarly, the D.C. Circuit upheld against a Commerce Clause challenge an ESA regulation protecting the Delhi Sands fly, an insect without recognizable economic value found in a tiny geographical area in California. The other three Circuit Courts that have addressed the question have also upheld ESA regulations protecting, respectively, the red wolf, the Alabama sturgeon, and the delta smelt. If other courts were to adopt the Utah court's approach, it could potentially undermine the federal government's ability to regulate the ESA because it would require federal courts to remove from protection most noncommercial species. Such an approach fails to recognize that, in a complex ecosystem, interrelationships between commercial and noncommercial species are complicated and intertwined. Moreover, as Congress recognized, some presently noncommercial species may prove to be of incalculable future economic value to the nation. Thus, the crucial issue the Tenth Circuit will have to address on appeal is whether the mere fact that a particular protected species has no immediately apparent economic value constitutes, by itself, grounds for concluding that its protection cannot meet the "substantial effects" test. Joseph Simpson JD'16, from Chino, Calif., is a second-year law student and staff editor at Vermont Journal of Environmental Law. He graduated from Iowa State University in 2013 with majors in history and political science. He is interested in land use law and hopes to use his knowledge to preserve natural ecosystems, especially the underappreciated desert. Professor Peter R. Teachout is recognized for his expertise regarding the constitutional law and history of Vermont and the United States. The courses he has taught at Vermont Law School include Constitutional Law, International Regulation of Trade, Legal History, Jurisprudence, and Argument and Culture.